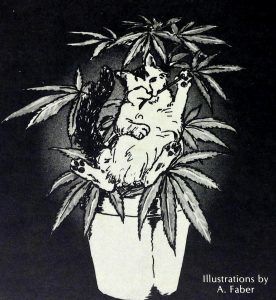 If you are looking for some practical advice on how to grow cannabis under fluorescent lighting I’ve got just the book for you! A guide to growing Cannabis under fluorescents by C.E. Faber was published in 1974. Tips on soil, lighting, containers, pruning, and the best types of seeds are only a few of the chapters in this book. What you do need to worry about are things like aphids. Typically they attack the tender growth tips and buds and can injure plants by sucking the juices from both the stems and leaves of the plant as well as excreting honeydew which serves as a culture for black mold. Unchecked they will spread over the entire plant then move onto others. 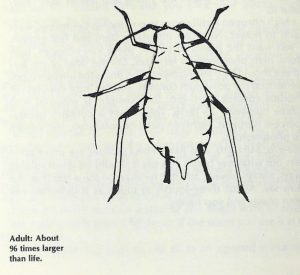 Aphids are only about one thirty-second of an inch long and are prodigious at producing offspring. Faber counsels that there are really only two choices, one involves going organic and using their natural enemies either the ladybug or the praying mantis and the second involves spraying with insecticide. 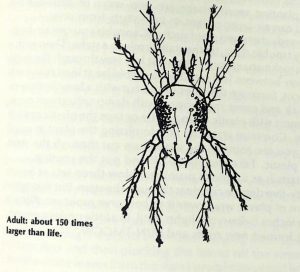 Another pot foe is the two spotted spider-mite. They feed off the plant in the same manner as the aphid causing the leaves to turn a stippled grey-yellow, then brown only to fall off the plant. They can vary in color and are so tiny it takes a magnifying glass to see them clearly. Often you can only spot them by looking at the underside of the leaves where small dots of silver indicate the webs to which eggs are attached. They multiply quickly and your only option is spraying with insecticide again and again. Location is as you might imagine is extremely important. The plants need fresh air for the carbon dioxide, so if you are going to put them in a closet be sure to open it for air circulation every day. If you are committed to growing pot in your house you also need to think about your pets. Cats in particular love to nibble on vegetation and if you aren’t careful you may come home to a plant that has served as a tasty snack. I’ll leave you with some of Faber’s advice…“One more thing. Plants do prefer classical music to rock; violins to electric guitars, Stravinski to the Stones, so if you have a predilection for rock it would be best for your plants to have them in a separate room from your stereo.” A guide to growing Cannabis under fluorescents / by C.E. Faber ; ill. by A. Faber. Philadelphia : Flash Post Express, 1974 can be found in Widener’s collection.